May | 2017 | Schott, P.C. 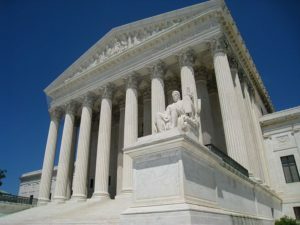 The Supreme Court issued a unanimous decision (it does happen) today in TC Heartland LLC v Kraft Food Group Brands LLC. The Court found that a plaintiff must bring patent infringement suits in the defendant’s state of incorporation or where the defendant has committed acts of infringement and has a regular and established place of business. This holding overturns almost 30 years of precedent in the federal courts and should put an end to the odd popularity of geographically inconvenient districts like the Eastern District of Texas. The United States Federal Circuit Court of Appeals had interpreted this section in view of 28 USC 1391(c), which states that “[f]or purposes of venue under this chapter, a defendant that is a corporation shall be deemed to reside in any judicial district in which it is subject to personal jurisdiction at the time the action is commenced.” VE Holding Corp. v. Johnson Gas Appliance Co., 917 F. 2d 1574 (Fed. Cir. 1990). This holding should give rise to increased patent litigation suits in Delaware and other states that are friendly to corporations. Justice Thomas wrote the opinion for the Court. There are nearly 2,000 different state incentives and thousands of federal programs currently available to businesses in the US. Many organizations miss out on substantial benefits that are in place specifically to support growth. Pennsylvania has a variety of incentive programs available to for-profit companies. Two are mentioned below. In both cases, the benefits are given in the form of a sellable/transferable tax credit. This means that if a business is awarded one of these tax credits and does not need them to satisfy a liability, they can sell the credit to another entity. The credit is then monetized and provides an additional source of capital to their business. Available to biotechnology, technology, life science or manufacturing focused businesses located in PA within one of 28 zones throughout PA. Established to foster innovation and create entrepreneurial opportunities throughout the state. There are 28 zones located throughout Pennsylvania. This tax credit is transferable and sellable for cash. Businesses in targeted industries must be involved in the creation of a product or process for commercialization. Company must be less than 8 years old. Located in KIZ for 2 consecutive years (the base year does not need to be a complete year). Demonstrate increasing gross revenues (including grants). Must have either payroll or property factor in both years. Complete required semi-annual KIZ Force reporting. Maximum tax credit award amount per year is $100,000 based on 50% of year over year increase in revenues. Available to companies who incur qualified research expenses within Pennsylvania. Program created to assist with the growth and development of technology-oriented businesses. Not zone related – available to all for-profit entities regardless of their age. Tax credit is transferable and sellable for cash. Qualified research expenses (QRE) to be incurred within PA. Minimum 2 years of QREs to apply for tax credit (base year does not need to be a complete year). QREs are defined by IRS Code and may include wages, disposable office supplies, contract research and patent costs. Companies valued at $5M or less receive 20% tax credit versus year over year increase in spending. Companies valued over $5M receive 10% award versus year over year increase in QREs. For US companies who incur qualified research expenses – permanent benefit beginning in 2016. Dollar for dollar reduction of liability, taken at tax filing. Special incentives for start-ups – can reduce payroll tax liability. Can be used to offset Alternative Minimum Tax – AMT. Tax credit is not transferable – can be carried forward 20 years. Use – apply credit against a state tax liability including personal income tax, corporate net income, capital stock and franchise tax. Federal tax credits can be used versus federal liabilities. Carry forward – use in future years versus tax liabilities according to guidelines which vary according to each program. Sell – if the tax credit is sellable/transferable, once you have deducted the state liability from the total award, the remainder can be sold for cash. Federal R&E tax credit is not sellable.